Goodreads “read” shelf updated: I did post quite a few reviews on GR as well. All of the blog reviews, plus most, if not all, of the Amazon reviews were posted there. More importantly, I updated my “read” list. Thursday night, I had 142 books on my “read” shelf. I now have 224. I’m still not done. I have 60+ read books on my Kindle that I need to mark as read. American Red Cross: $350 plus a $25 donation match from an employer for a total of $375! Thank you! Don’t forget you can win a $20 Amazon gift card by helping to spread the word! The Rafflecopter is open until midnight and these charities still need our help! 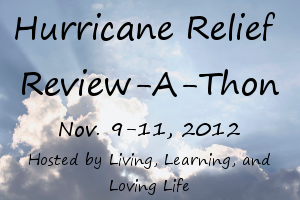 This entry was posted in Blogging and tagged charity, hurricane relief, review-a-thon, reviews by Amanda Beaty. Bookmark the permalink.